Donny Cates Signing! God Country & Babyteeth Exclusive TPB! It's back on! 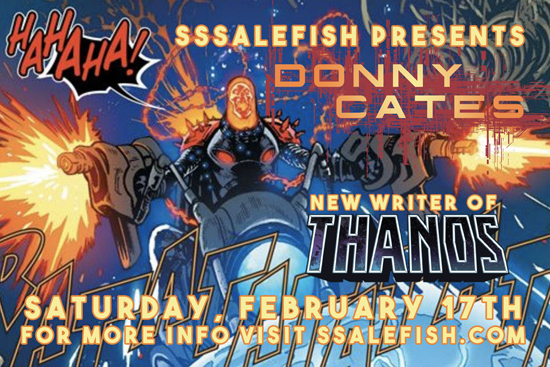 Join us as the hottest writer in comics, Donny Cates, visits BOTH Ssalefish Comics locations (Greensboro 12 - 2 PM • Winston-Salem 4 - 6 PM) on Saturday, February 17th! Donny has been the most prolific writer in comics throughout 2017 and into 2018, having penned scripts for IDW (Deviation X-Files and Deviations Star Trek), Image (God Country, Redneck and Atomahawk), Dark Horse (Ghost Fleet, Buzzkill, & Paybacks), Vault (Reactor), Aftershock (Babyteeth) and Marvel (Doctor Strange & Thanos)! We'll have various printings of all of his work, including our exclusive paperbacks for God Country and Babyteeth, available for purchase, but you're welcome to bring anything you already own to have signed as well!